When no intermediate in between and you buy directly from the insurance company, there will be no chance of fraud. In some cases e.g. travel , motor insurance etc. you will get the policy immediately (via email or online). Always check the Insurance Agent Licence before buying anything from him. Check this thread on things you need to check in the Agent’s Insurance Licence. Always pay the insurance premium buy cheque or credit card or online. The premium will directly go to insurance company and you have an additional proof of payment via bank/credit card statement. If you have a cover note (e.g. car insurance) or Previous Policy, match your details (insured name, address, coverage period, insured’s declared value etc.) with the policy. 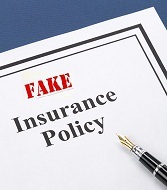 All the insurance companies mention details of the cover note or previous policy, on the policy document. Insurance Companies are also fighting fraud by using “bar code printing on the face of policy”, “hologram sticker” etc. If you have bought insurance policy long before, the best way is to call the customer care of the insurance company and check the status of the policy.